The hotel idealy situated between Nice and Monte-Carlo, has been totally refurbished, all of its 35 air-conditioned rooms overlook the bay and Cap Ferrat. Since December 2002, they all have a balcony with nice seaview. All rooms are equiped with television, minibar, safe and direct phone. Many artists have stayed at the Hotel Welcome, and the official hotel's history web page tells more, including about one who was Jean Cocteau who wrote about spending the best days of his life here. The Welcome opens to the public its wine bar on a terrace on the sea. The Wine Pier allows you to taste, in a pleasant and Mediterranean colour surrounding, carefully selected wines and many cocktails (closed on Mondays). 12 restaurants from the most typical to the most "fashion" and from the most casual to the most refined are located at less than 100 yards. We will be pleased to advise you according to your tastes. 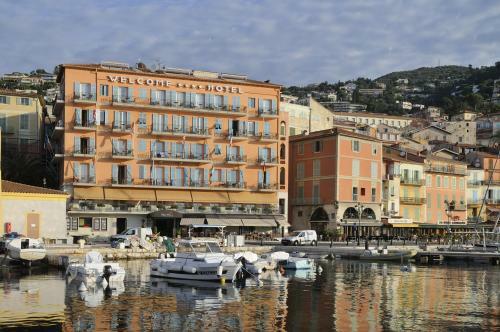 The beaches of Villefranche are close by and a popular diving club is right in front of the hotel, catering for beginners & experts. Regular boat trips to Cannes & Monaco leave at regular intervals throughout the summer. Lots of information about cultural activities, leisure programs, and festivities is available from our hotel concierge. He can also organize local transportation and sightseeing, and deal with any reservations.